Around the wider world of golf: Cristie Kerr got her third worldwide win of the year at the Sime Darby LPGA Malaysia; Bernhard Langer won his seventh title of the year (and has now gone two for two in the Champions Tour Playoffs) at the PowerShares QQQ Championship; Brian Richey went wire-to-wire at the Roberto De Vicenzo Punta del Este Open Copa NEC on the PGA TOUR Latinoamérica; Emma Nilsson won the Santander Golf Tour LETAS El Saler in the season's final LET Access Series event; Kodai Tatsuya won the Mynavi ABC Championship on the Japan Golf Tour; Panuphol Pittayarat won his first Asian Tour event at the Indonesia Open; Ryan Armour got his first win at the Sanderson Farms Championship, the PGA Tour's alternate field event; if I read this correctly, Hye Sun2 Kim won the SK PINX SEOKYUNG LADIES CLASSIC on the KLPGA; and China's Lin Yuxin won the Asia-Pacific Amateur. Although Dustin Johnson appeared to have run away with the HSBC entering the final round, the event turned out to be a real nail-biter. Nobody predicted the ending, nobody could even believe it -- despite watching it happen before their very eyes. 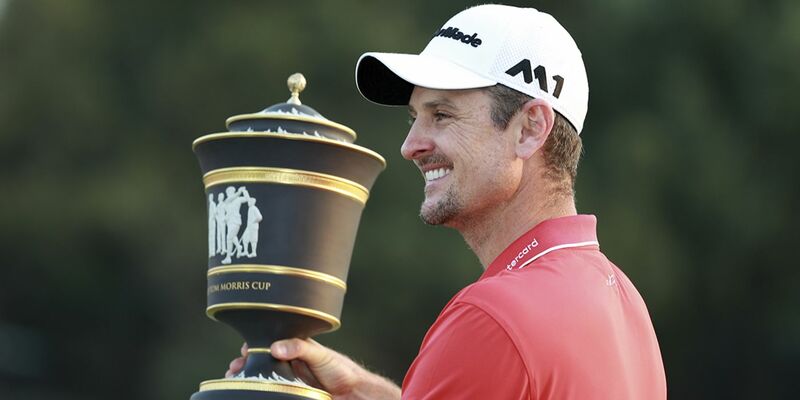 Even Justin Rose couldn't believe it, though we've all been there. It's just hard to believe it could happen to DJ. A six-stroke lead slowly dribbled away as he failed to make a single birdie in his final round, struggling to a round of 77. But it's easy to forget that almost everybody had problems during the final round. Chilly winds made the Sheshan International course much harder than most expected and they failed to make the proper adjustments to their strategies. Rose -- written off by most as being too far back -- didn't make that mistake. It seemed to me that he was cautious about his drives, often having a longer shot into the greens than his playing opponents but managing to play from the fairways. While the rest bombed shots long and wide of their targets, often attacking sucker pins, Rose tended to hit lower shots into the safer areas of the greens and trusted his putter. The result was the low round of the day, tied only by Phil Mickelson. Of course, since he finished ten shots behind Rose, Phil's round didn't really threaten the lead. And their accompanying Limerick Summaries. What a haul! He was steadiest under the gun. For the second week in a row a tropical system, this time Severe Tropical Storm Saola, wrought havoc on the golfing calendar in northeast Asia as it skirted along the Japanese coast along a line similar to Typhoon Lan the week before only without making landfall. The JGTO and JLPGA didn't bother trying to play on Sunday. The 54 hole winner of the men's event, the Mynavi ABC Championship, was Tatsuya Kodai, while the Hisako Higuchi Mitsubishi Electric Ladies title was awarded after two of the planned three rounds to first time winner Kana Nagai. The fierce winds on the backside of Saola were felt in Korea as well, forcing the KLPGA to suspend play in the third and final round on Jeju Island and ultimately abandon it altogether. Since two players were tied after 36 holes they had to wait until the winds subsided enough to contest a three hole aggregate playoff between tour leader Jeong Eun Lee 6 and Hye Sun Kim 2, which the latter won by a two stroke advantage after both scored par on the first two holes. It was Kim's maiden victory on tour. Meanwhile in the southern mainland city of Gimhae the KPGA soldiered on through the tough conditions to complete the KJ Choi Invitational, won by 43 year old Inchoon Hwang after a four hole sudden death playoff over Sung Kang (who had the round of the day with a 66) and Minchel Choi. Since the LPGA is in Japan this week for the Toto Classic here's hoping the weather cooperates this time. The outlook for Iberaki prefecture where the Taiheiyo Club is located calls for 60% chance of showers Friday, partly cloudy Saturday and sunny on Sunday with the mercury in the 16-19C range.